‘Davos moments’ as the regulars call them, are when somethings unexpected and big happen to you – meeting a personal hero, or saving a head of state from slipping on the ice. As Davos week winds down, the ritual is to exchange one’s Davos moments with others over drinks. Just as I thought this year would go by without a Davos moment, the moment came. And it was, literally, the best ever! SLX Swiss Learning Exchange is an ed-tech startup in Switzerland that creates blended-learning programs on its platform and shares the spirit of inclusivity that engages youth and peer-learning which the Open Forum wants to achieve. As this was not my first Davos experience, I had grown accustomed to the usual noise on the global economy and the need for greater partnerships and the PR announcements to kick off ambitious projects aimed at ‘improving the state of the world’. The usual media frenzy regularly came up with headlines like « Global elite descend on Davos », “Global economy at risk due to climate change” and so on like it was really “news”. Very few of the news media usually show up at the World Economic Forum Open Forum, which is open to public at the local school auditorium. Most don’t know it even exists! Emotionally intense moments that move you to tears are not what I had come to expect at Davos. My team and I from Swiss Learning Exchange had decided to attend the WEF’s Open Forum session – The Price of Free. The session details said: Join Nobel Peace Prize Laureate Kailash Satyarthi in a special screening of the documentary, The Price of Free, portraying his fight against child slavery in his home country of India and now around the world. I started Swiss Learning Exchange to do our part in helping people cope with the fast-changing world around us. In that spirit, I was keen to hear Kailash Satyarthi speak, but I sat at the edge of the row unsure of whether I should watch a 90 minute documentary at Davos. I could potentially have watched it later and instead headed out to network at the many private events and parties all around Davos. After the first couple of minutes, I was completely spellbound, as was the rest of the audience, riveted to Satyarthi’s amazing story. After the screening, as Kailash Satyarthi walked on to the stage, what followed was nothing short of extraordinary. Hands were raised, slogans were shouted and tears were rolling in a packed audience of Swiss people – old and young – as the Indian Nobel Peace Laureate’s story touched not only their minds but the hearts of everyone in the local alpine school auditorium. Regardless of which language the session was followed in, in English, French or German, everybody was inspired by his example and his call to action. But the real ‘Davos moment’ came as Satyarthi was leaving the room, and it was nothing short of a spiritual experience in the mountains. 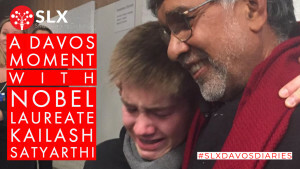 Another Swiss teenager, Jonas did what we all wanted to do – give Kailash Satyarthi a big heartfelt hug and thank him for his amazing work. As he hugged him, Jonas was overcome with emotion, an intense moment that we were lucky enough to capture on our cameras and phones. Jonas allowed his pent up emotions to overflow in a spontaneous expression of love and compassion for Satyarthi’s cause. Jonas, I do not know who are you and how to reach you but if you watch this and if you are reading this, know that I shared your emotions as you hugged Kailash Satyarthi. Watch the video. Click here. I would so love to meet you and talk to you. Globalization 4.0 was the theme set by the WEF at Davos in 2019. We at Swiss Learning Exchange watched first-hand how Kailash Satyarthi moved the Swiss youth at Davos towards a globalization of compassion. This is the kind of ‘Davos Men’ I hope Jakub and Jonas will become someday.